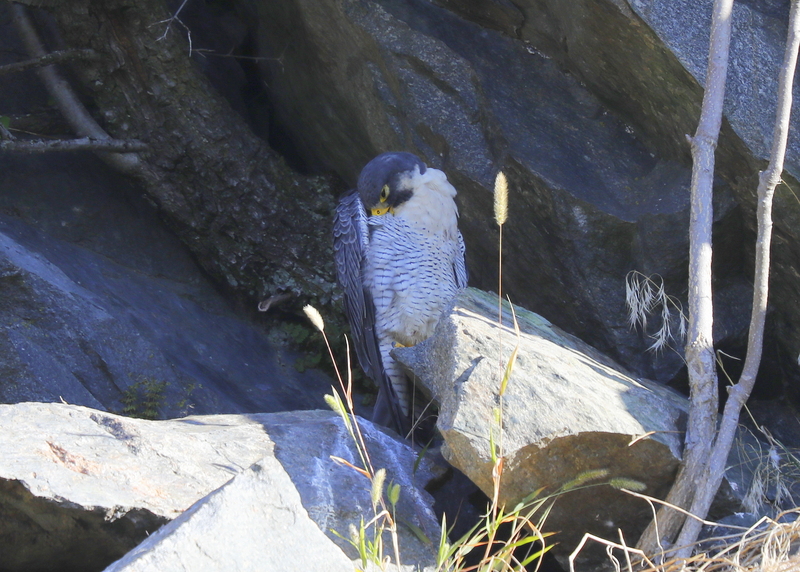 You are browsing the Blog for peregrine falcon preening. Made a late afternoon visit to the Clock Tower under clear skies, bright late day sun, light winds from the SE, and temp at 64F. 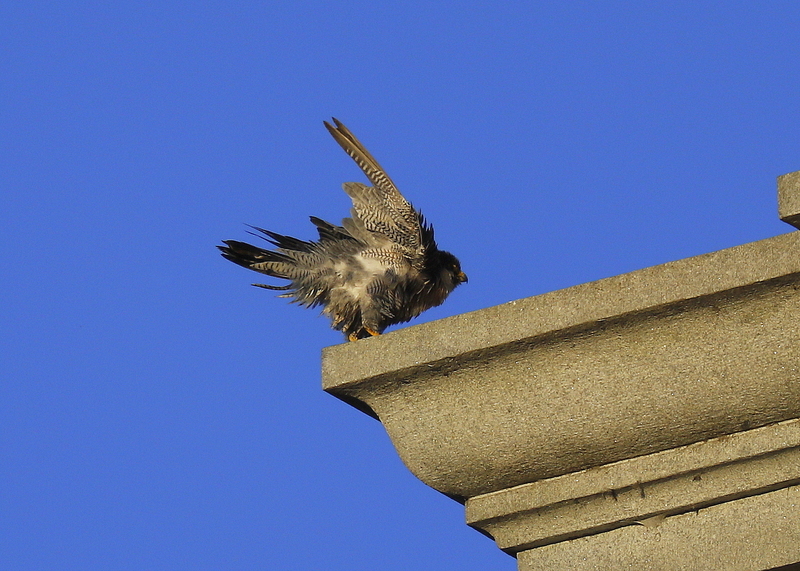 The adult male had just returned to a ledge on the NW corner below the clock face. 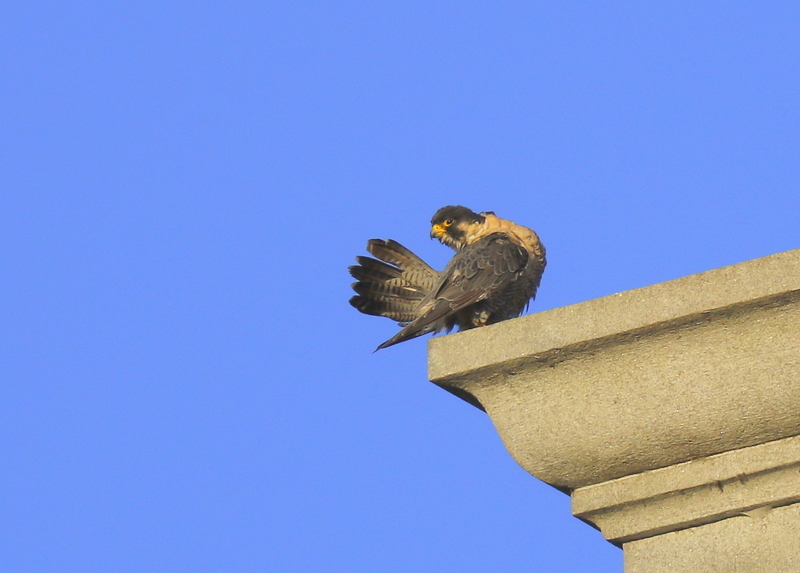 One thing the peregrine falcon does a lot is preening. Many hours each day is spent on the care of feathers, beak, cere and feet. Sometimes it seems like pure vanity, but it is in fact a necessity. Without well preened feathers the peregrine could become soaking wet when it rains, become ill and die. Or feathers that are not well groomed will cause drag when flying. When preening birds run their beaks through their feathers or scratching their heads with a toe. Rousing is the the action of a peregrine erecting its feathers and then shaking them; part of grooming; a sign of a relaxed and content bird. Peregrines typically rouse (shake) after preening; also rouse during flight, particularly after leaving perch (unless to initiate a pursuit). A Monday morning flyby visit with clear skies, bright sun, winds from NW at 5MPH, and temp at 63F. The adult male was perched on the nest ledge and preening with its bill. Preening keeps the feathers neat, preserving their streamlining and insulating effects as well as their color pattern. Preening may help to remove any possible external parasites.